Something about Fall makes me want to craft. Colder weather? More holidays? The fact that my eldest son is in school 1/2 days 4 days a week? 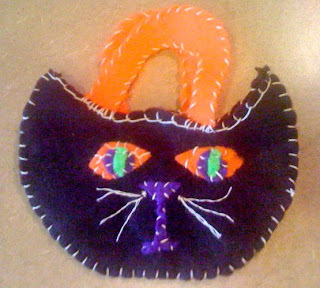 Anyhow...this little kitty is one of my latest creations. Halloween crafts are super fun and many of them are pretty easy to do too. This one I made in a few hours. Super easy but a little tedious. 2. Begin the tedious job of blanket stiching the face on one of the cat heads, I also added whiskers by looping string through and tying a knot at the point where it comes out of the felt. Then I cut the end of the loop and untwist the floss to give whiskers. Eventually I will fill the little bag with Halloween treats and give it to a friend. Next I'm going to try a pumpkin head! So I decided that I am bored with the hair as of late. It's long, it's brown, it's BORING! What do I do? I thought that maybe at 10 p.m. I would be able to do this without kiddos coming onto the scene. However, a few minutes ago I heard the unmistakable tip tap of feet in the hall. Kieran decided to wake up and want some snuggles. I had to wake up Sleeping Beauty and have him take Kie to our room. Not so good at snuggling with dye dripping in my hair. I wonder if I will regret the decision to dye and cut tomorrow am? Okay even though my son's birthday isn't until December I have been working with him on a theme. We've rocked the dinosaurs for 2 years now and I am so not into it for year #3! I think I have finally convinced him to do ROBOTS!!!! So I have been googling like crazy for robot related stuff. And I have found some cool stuff. Which as the next few months unfold I will probably post here. My first exciting endeavor is to make a robot out of cloth. Luckily I have stockpiles of fabric in my garage. I let Kieran pick out some acceptable patterns-he chose a star print and grey swirls. 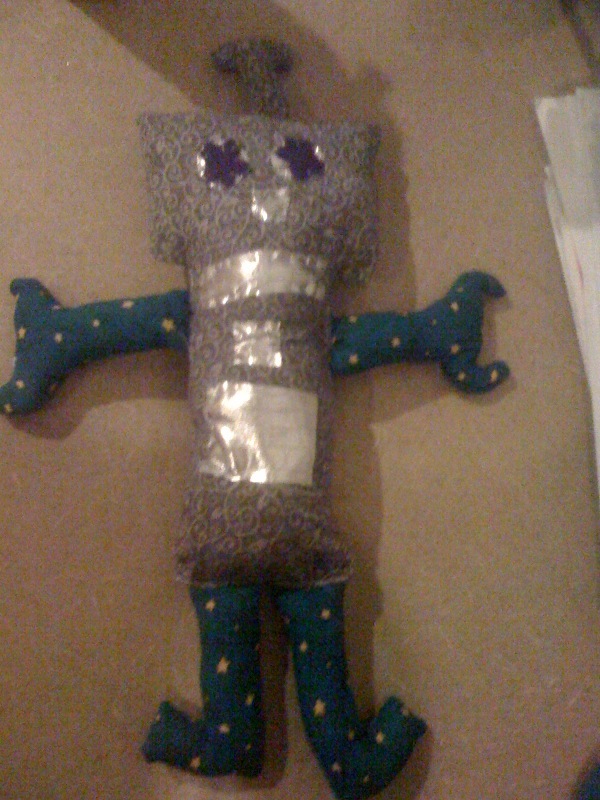 I have this great book of patterns for stuffed animals and I just modified one of the dolls into a robot. Anyhow, the end result is 2 pretty lame robots but not bad for a first attempt. Wish me luck on the next try. So every fall I try to do a few leaf related crafts. This one is super easy. It just takes some contac paper, some squares of tissue paper, and construction paper. Basically you cut a leaf shape out of the construction paper. I am lazy and didn't want to find a leaf shape online, print out, etc. so I just free handed a couple. 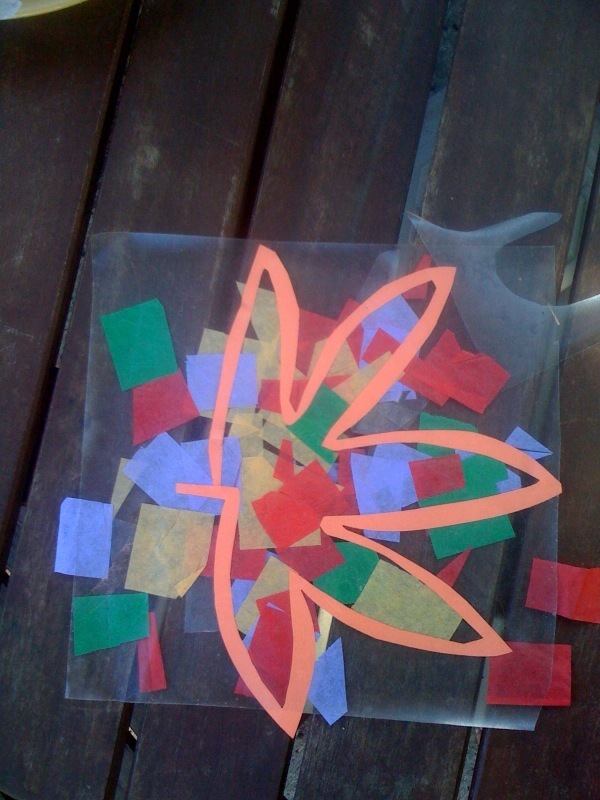 Anyhow, once you have a leaf shape you then cut out the interior and leave just a leaf outline. Next you cut a piece of Contac paper that is just a little bit bigger than your leaf outline. Remove the backing and then press the leaf outline down. Then put the squares of tissue paper on the contac paper. They stick really easily and you can do some overlapping. 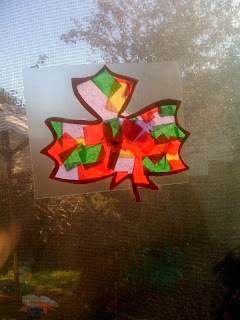 Last but not least you then cut around the leaf shape and hang the finished product in a window. In my picture the laziness factor got the best of me and I didn't cut around the leaf-although the extra contac paper proved a useful way to hang the leaf up on my sliding glass door. BTW my 2 yr old rocked this one. Super easy for him to put the tissue paper squares on the leaf and feel like he really did the project. His is the 1st leaf.